If you’re anything like me, catching a glimpse of something cute, or nice, or funny can make you smile. The cool thing is that you don’t have to wait around for something cute, or nice, or funny to happen. That’s right – smiles are always just a few deliberate, staged steps away. Take this cutie, for example. She’s holding a heart shaped waffle sprinkled with powdered sugar. How did this waffle make its way into her tiny, little hands when she clearly didn’t spend the morning slaving away over Bob’s Red Mill waffle mix? 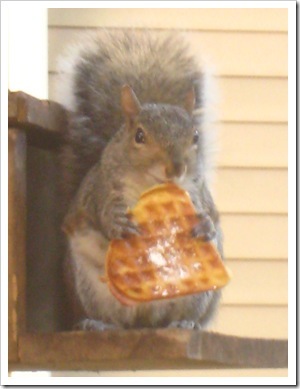 Someone thought, “Wouldn’t a squirrel nibbling on a heart shaped waffle be a sweet, sweet sight?” With a waffle iron on hand, they proceeded to make it happen -- they made the squirrel happy, and they made me smile. 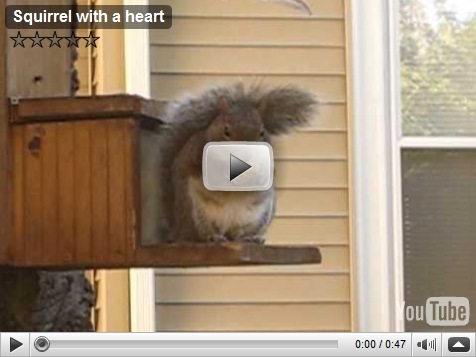 For your enjoyment, here’s a video of the same squirrel finishing off her SECOND waffle. I’m pretty sure she’s stuffed by this point (she ate the first one much more quickly). After this, she grabbed a third and ran off with it when a bird squawking near by spooked her. What sorts of things make you smile? Can you think of any ways you can stage them? Your blog makes me smile and think - and that is fun! Tx.